Time for today’s fashion history lesson: bell bottom trousers! 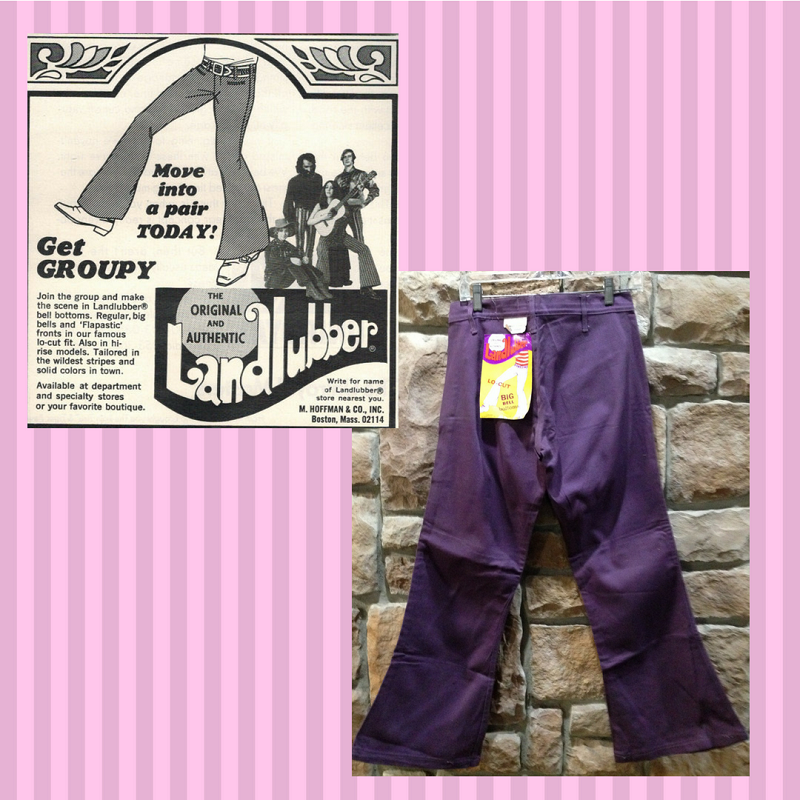 We recently found a great bunch of old Landlubber brand bell bell bottoms, and started wondering about their history. Bell bottom trousers have been around since at least 1813, though most people associate them with the 1960’s. Let’s look a little deeper at the development of this groovy style. Blue bell bottomed pants were worn by U.S. sailors in the early 1800’s, along with canvas hats and blue jackets. In the mid 1800’s, the British navy began wearing wide legged pants, but they weren’t really bell bottoms. They finally converted to flared trousers in 1977–took them a while to join in! So why does the navy wear bell bottoms? Possibly because they are easy to roll up, so sailors can work in bare feet. No one is really sure. Coco Chanel put women is wide legged “yachting pants” in the 1920’s, but it was revolutionary for women to even wear pants then, so they did not become mainstream fashion. 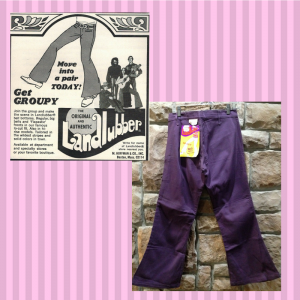 We’re not really sure why they became such a big hit in the 1960’s, but suddenly bell bottoms were everywhere. They became a huge part of hippie fashion. Bell bottoms continued their dominance of fashion into the 1970’s. They were now made of satin and more materials than just denim. And the bell just kept getting bigger. Who could forget “elephant bells”, those extremely wide bell bottoms that became popular in the mid 70’s? They looked perfect with platform shoes. But in the late 70’s, bell bottoms were no longer popular. The preferred pants of the club scene were tight spandex, and punk rockers wouldn’t be caught dead in them. But in 1996, bell bottoms were back! Only this time they were called “boot cut”, and had a smaller flare. However, over the next ten years, the bell got bigger and bigger all over again. Then suddenly, they were gone again, replaced by “skinny jeans”. This shows you how cyclical fashion is! Everything comes around again, just wait a few years. But if you don’t want to wait for the vagaries of fashion, you can always find cool bell bottoms at Backward Glances.